Today Boeing revealed their newest 747-8F cargo test aircraft in a brand new never before seen Seahawks 12th man livery. 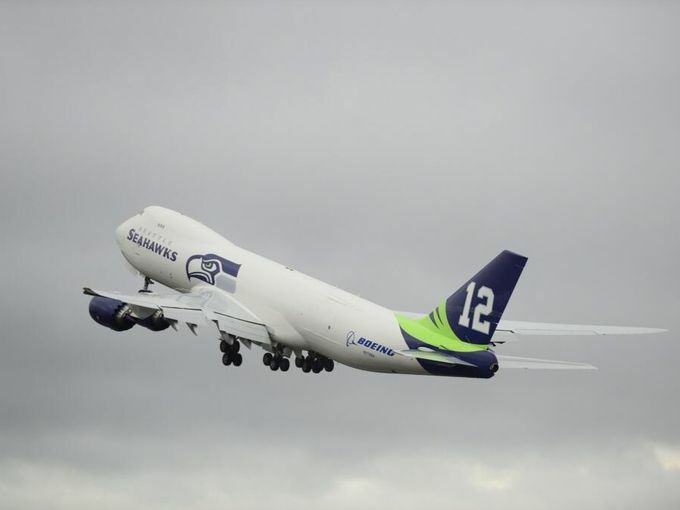 Thrilling fans, AvGeeks, and everyone in-between the 12th man LOUDER Seahawks jet is unlike any other! The NFL loudest fans now have their own JET! As a Seattle Seahawks sponsor, the company is giving the Super Bowl contenders a high flying 12th man that no other team can say they have — their own 747-8! From sea level on the Puget Sound to 30,000 feet, people & companies all over this nation will be screaming for the Seahawks louder than ever this Sunday, cheering on our Seattle Seahawks! For those of you who don’t know, I am from Seattle, my family works for Boeing, and we are TRUE FANS! GO HAWKS! The plane took off from Boeing Field in Seattle in route to Paine Field in Everette, WA but first drew a 12 over washington state!